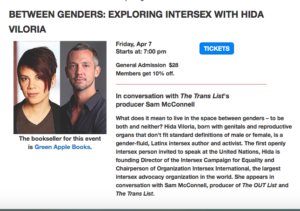 In conversation with filmmaker Sam McConnell, producer of HBO’s The Out List and The Trans List, at the Jewish Community Center’s “Arts & Ideas” Series, for the event “Between Genders: Exploring Intersex with Hida Viloria.” Please pre-order your tickets if possible here. Friday, April 7th, 7pm, SF JCC. 3200 California Street, San Francisco, 94118.